Cultured pearls are produced by pearl oysters as a result of delicate techniques developed by scientists over many years. However, the human role in the pearl production process stops with the successful completion of surgery for nucleus implantation and in providing suitable environmental conditions through careful selection of the culture sites. The actual pearl formation, which results due to an internal biological process, is left entirely to the pearl oyster itself. The quality of pearls with regard to their shape and colour, which are important factors in terms of their market value, are not only influenced by external environmental factors, but also by the inherited capabilities of individual oysters. 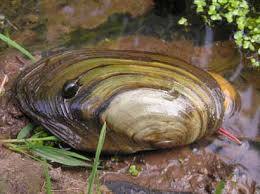 Freshwater mussels have three basic characteristics which distinguish them from other animals; these include 1) a two-valved shell, 2) a soft body, and 3) a muscular foot. The “soft” parts consist of respiratory organs, digestive organs, and other vital parts. The foot, often seen extended from between the two valves, aids the mussel in locomotion, burrowing, and positioning in the river bottom. The mussel’s shell contains several diagnostic characteristics which are helpful in separating the species. The shiny layer seen from inside the shell is called the nacre or “mother of pearl.” The nacre may be white, purple, pink, or pale orange. The outer layer is made of protein and serves to protect the shell. Shells come in a variety of shapes, including round, elongate, oval, or tear-drop shaped. The beak is the oldest part of the shell, and the end closest to the beak is the anterior or front. The outer surface may be smooth or have humps, ridges, depressions, furrows, and wings. The outer surface may also he shiny, dull or brightly colored with rays or plain. 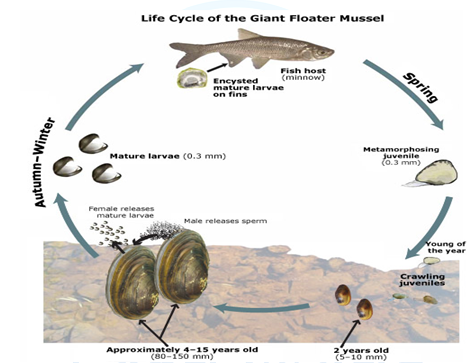 The mussel’s life cycle is quite complex. Fertilized eggs develop into larvae, called glochidia, remains within the gills of female mussels. Glochidhia, when released from the female, must come in contact with a host fish and attached as a parasite on its gills, fins or body. After a few days to several weeks, the glochidia detach from the host fish and settle to the bottom to begin their life as juvenile mussels. It may take several years (2 to 9) to become mature and reproduce. Mussels may live more than 70 years if surrounding conditions are suitable. When any pathological change, hyperplasia take place the epidermis cell of mantle may plunge into the mantle tissue with a piece of epidermis. Epidermis cell may start cell division and reduplication. Then the epidermis cell forms the pearl sac, secrets glue-like substance continually and accumulates into pearl layer. When sand insect or a parasitic organism accidentally enter as foreign particles in the mussels mantle , they may plunge into the tissue with a piece of epidermis , and epidermis cell may form a pearl sac secrets nacre continuously, accumulates around the intruder ,and forms the nuclei pearl. The pearl formation is a very complicated process, deals with inorganic chemistry, organic chemistry, biochemistry and crystallography. The main component of pearl is calcium carbonate covering about 90-95%. The mussel’s mantle tissue secretes the two main components of nacre, of which one is thin layers of the mineral aragonite and the other is glue-like substance called conchiolin. The conchiolin cements mineral aragonite in layers. The aragonite is translucent and light interacts with the overlapping layers to give the finish pearl its lustrous appearance. Pearl mussels also coat the inside of their own shells with nacre, so some shells are shiny and iridescent at inside. According to the principles natural of pearl formation, a price of foreign particle is inserted into a mussel’s mantle for pearl formation. A piece of mussel epithelial membrane located at outer edge of mantle tissue in increased into a mussel’s mantle. The inserted mantle tissue slice starts cell division and reduplication , then forms a pearl sac and secretes nacre, layer by layer , then accumulates pearl .The inserted mantle tissue slice is connected with the tissue of the operated mussel in the first week, then the epidermis cell starts cell division and reduplication and forms the pearl sacs. The period of pearl sac formation is inversely correlated to water temperature. The nacre secretion activity will stop if the water temperature is below 10°C. After the pearl sac is formed, in which the white glue-like substance appears immediately, and the nacre combines the free cells of the pearl sac into slice structure. The pearl sac secrets the nacre constantly and forms a spherical pearl particle. Layer by layer, the pearl particle enlarge and expands gradually. A nuclei with a piece of mantle tissue slice is inserted into the mussel’s body. Then the mantle tissue slice starts cell division and reduplication, and form a pearl sac surrounding the nuclei. The pearl sac secretes nacre to cover the nuclei; finally a pearl with nuclei can be created. Color: Pearl come in a large range of colors varying from silver and white to gold, pink etc, Purple gold and black pearl fetch the highest prices in the market. Luster: The appearance of a pearl’s surface judged by its brilliance. Shape: Pearl may be sphere, half sphere, oval, pear-like, spindle-like, and irregular shape. Gravity: The gravity of pearl is about 2.73. Rigidity: Pearl have very heard material, rigidity varies from 3.5 to 4.5, similar with iron. The components of pearl are calcium (91.59%), water (3.97%), organic matter-conchiolin which consist of a number of amino acid (3.835), and other elements (.61%). The criteria of identifying the pearl quality are size, surface, shape and luster. Size: Size of pearl usually measured by weight or by diameter (mm). Other things are being equal, the large the pearl size, the greater the value. Surface: Surface of pearl quality refers to the number of imperfections percent such as pits. There are common, the smooth surface is better, and perfect flawless pearls are rear and highly priced. Shape: For marketing, the round shape pearl is better. Luster: The more brilliant is better as the luster of pearl. HRM Practice in the Bank of Bangladesh.